Just in time for fall, today for lunch we made Baked Pumpkin Risotto– hit the link for the recipe, and in case you’re wondering where they give you a choice of butternut squash OR pumpkin, we went for pumpkin, making the puree ourselves! 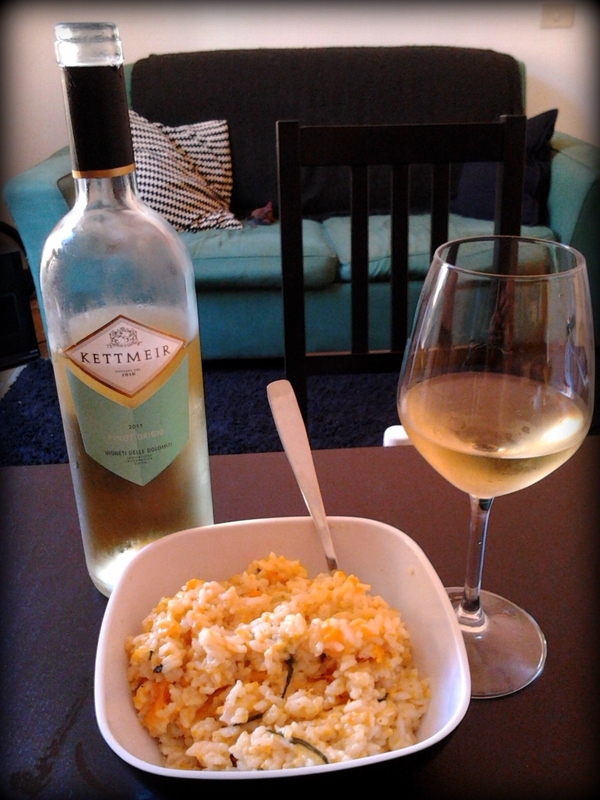 For wine, I matched by geography, meaning risotto’s are typical of northern Italy so I chose a simple white wine from the Trentino Alto-Adige area: a Pinot Grigio (Kettmeir, 2011, Vigneti Delle Dolomiti IGT). The wine was crisp, acidic, hints of melon and ripe apple, and overall medium in taste which complimented the risotto dish pretty well. Other potential wine buddies to this Risotto could be (though are not limited to): Chardonnay (the less oaked the better), Pinot Bianco, Muller Thurgau, or Sauvignon. This entry was posted in Food & Wine Buddies, White Wines and tagged Food and Wine pairing, Italian food, Italian recipe, Italian Wine, Pinot Grigio, Risotto, Trentino Alto-Adige. Bookmark the permalink.